While playing Suzette, a cordon bleu cook in the Zurich Comedy Club‘s production of Don’t Dress for Dinner (November 6-16, 2013), I cooked all the dishes named in the script. This was the dessert course: Raspberry pavlova. I’ll preface this post by saying that it probably took me longer to make this dessert than the entire running time of the play. That said, it really wasn’t difficult. Pavlova is often described as a “meringue cake with light, delicate, crisp crust and a soft sweet marshmallow center.” It was named after the Russian ballet dancer Anna Pavlova (1881 – 1931). Anna Pavlova is most recognized for the creation of the role The Dying Swan, choreographed in 1905. Amazingly enough, a clip of her dancing this piece can be seen hereon YouTube. With her own company, Pavlova became the first ballerina to tour around the world (Wikipedia). The dessert pavlova is believed to have been created in honor of the dancer either during or after one of her tours to Australia and New Zealand in the 1920s. Both nations claim to have invented it. The dessert is a popular dish and an important part of the national cuisine of both countries and is frequently served during celebratory and holiday meals. There is a good overview on the history of this dessert here on What’s Cooking America. What is the difference between a pavlova and a meringue? I was confused by this distinction because the ingredient lists for both recipes look very similar to me. So I researched this question and found several possible answers. Answer 1: A pavlova is covered in berries or other fresh fruit. This may be possible, however I also found recipes for meringues with fillings or other fruit toppings. Answer 2: Meringues are eaten as individual cookies and a Pavlova is most commonly eaten as a single round “meringue cake,” which is cut into slices. I also found recipes for individual-serving pavlovas. Answer 3: A meringue is stiff and a pavlova is more chewy/marshmallowy. The addition of vinegar (or, in some cases, cream of tartar) seems responsible for keeping the the texture inside the pavlova chewier. This seemed to me the most convincing answer. So how does one make a pavlova? This is how my pavlova looked when it went into the oven. After it is baked and cooled, one tops it with whipped cream and fresh fruit, such as berries or kiwi. (Although it looks perhaps a bit less pretty, I used frozen berries on my pavlova because raspberries were not in season here.) I hope yours tastes as good as mine did. A meringue cake with light, delicate, crisp crust and a soft, sweet marshmallow center. It is topped with raspberries and whipped cream. Preheat oven to 150 °C (300 °F). Place the rack in middle of the oven. Using a pie plate or bowl, trace a circle on a piece of parchment paper. (The one I used was 22 cm or ca. 8.5 inches in diameter.) Turn paper over so the line is visible, but is on the underside of your paper, so it does not mark the pavlova. This is your guideline. Mix vanilla sugar and sugar and set aside. Blend the vinegar with the cornstarch and salt. Set aside. In a clean, medium-sized metal or glass bowl, beat the egg whites with a clean electric mixer on medium speed until they are stiff. Add sugar mixture very gradually while still beating until your mixture forms stiff, glossy peaks. Slow beater and add vinegar mixture. Spread mixture out to cover circle on the silicone paper, building up the sides so they are higher than the center. It should be concave. Place the baking sheet in oven then immediately turn down the heat to 140 °C (285 °F). 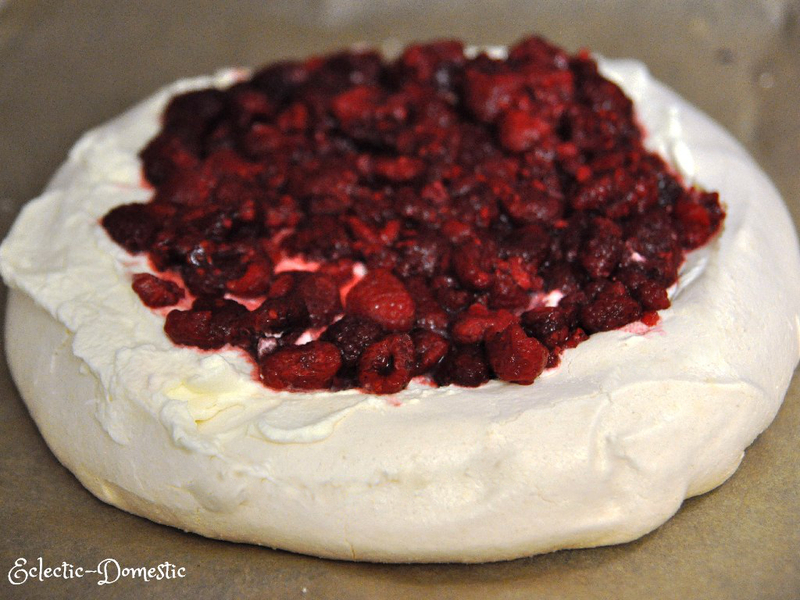 Leave to cook for 45 min–1 hour until the pavlova is crisp and dry to the touch on the outside but not browned or cracked. If you see it browning, turn the oven down. It should have a very pale, pinkish eggshell color. The pavlova should have a marshmallow-like texture on the inside. Turn the heat off, and leave the oven door slightly ajar to let the pavlova cool. As it cools, it may crack slightly. At this point, the baked, cooled pavlova can be stored in a cool dry place, in an airtight container for a few days. Whip the cream with the vanilla sugar until soft peaks form. 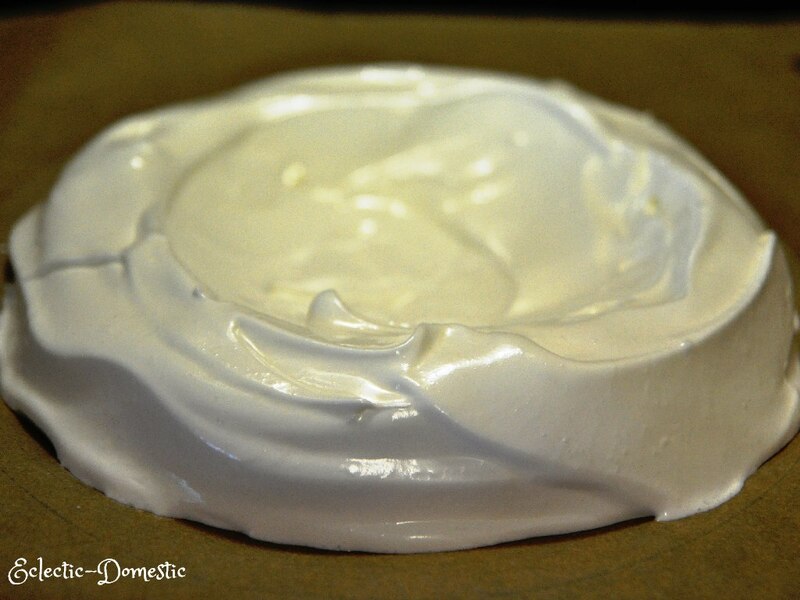 Gently spread cream into the center of the pavlova. Arrange the fruit randomly or in a decorative pattern on top of the cream. Serve immediately or refrigerate for up to an hour. This dessert does not hold very long. Tip: If you substitute 1 tsp. vanilla extract for the vanilla sugar, mix the extract into the vinegar mixture, not the sugar.